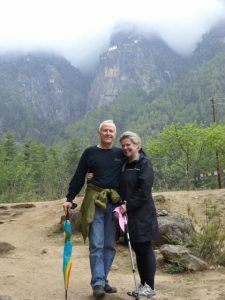 On behalf of the Kongma Sakyong and the Kalapa Council, the Office of the Sakyong is delighted to announce the appointment of Ron Renz and Janet Whelan as Co-Directors of Gampo Abbey. They are succeeding Director Richard Haspray, who along with Shastri-in-Residence Alice Haspray, served in their positions for more than three years. Ron, a Scorpion Seal practitioner, was the director of Dorje Denma Ling from 2002 – 2005. He is trained as a physical therapist, a Feldenkrais Practitioner and a Workshop Facilitator in Nonviolent Communication. Ron most recently served as the Academic Coordinator of Clinical Education and as an instructor at Dalhousie University School of Physiotherapy. Janet is a long-time practitioner holding a Masters of Educational Psychology with a concentration in counselling and human relations. She served as executive director of Colchester East Hants Hospice Society; had a private practice with a focus on career counselling; was executive director at Laing House Foundation, a peer support organization for youth with mental illness; and was the development manager for Symphony Nova Scotia. Both Ron and Janet lived at Gampo Abbey, Ron as a monastic from 2001 – 2002 and Janet in public relations and administration in 2004. For the past decade they have been residents of Halifax. Ron and Janet bring the inspiration, commitment, skills and experience needed to lead Gampo Abbey at a time when the Shambhala Monastic Order is becoming more firmly planted in our world. Please join the Sakyong and the Kalapa Council in welcoming Ron and Janet to their posts, and in extending deep appreciation to Richard and Alice Haspray for their most loyal, wise and kind years of service in strengthening Gampo Abbey and the Shambhala Monastic Order. Wonderful news! Congratulations to Ron and Janet and a big thanks to Alice and Richard for their dedication to Gampo Abbey. Such great news! Congratulations to Janet and Ron…. my dear Atlanta-friend Ron whose light, wisdom and creative vision have uplifted many hearts and minds in many ways. Ashe!